Born in London, Neil was destined from a young age to become an artist; drawing everything from comic book characters to war scenes. He was fuelled by his rich imagination and would while away many hours thinking and drawing. In his late teens and early twenties, Neil worked a variety of jobs, never really believing that painting could be a full-time occupation; but deep down he always wanted to be an artist. During a trip to Harrogate in the late 1960’s, Neil was inspired by the majestic scenery of North Yorkshire. This proved to be a revelation and he decided to move from London to Harrogate to become a full-time professional artist. With no discernible influences, recognisable style or formal training, his work took many twists and turns as he experimented, searching to find his identity as an artist. He began to paint a diverse range of subjects using a variety of techniques and media, believing that the broader the subject matter and style, the wider the appeal. Though these paintings were proving popular and were receiving admiration for their technical proficiency, Neil felt his work lacked a powerful subject matter. The birth of his first child was a huge turning point for him, the sense of responsibility led to a time of deep reflection for Neil. It was whilst looking at one of his paintings propped against the studio wall that he began to imagine the foreground of the painting spilling onto the floor. He emerged from this introspection knowing he wanted to create paintings that had elements of the impossible and that were capable of transporting people into an alternative vision of reality. Being inspired by these new ideas and concepts, his distinctive use of oil paints allowed him to release his visions; the subtlety and blending of glazes enabling him to create the depth of colour and tone he had been searching for. 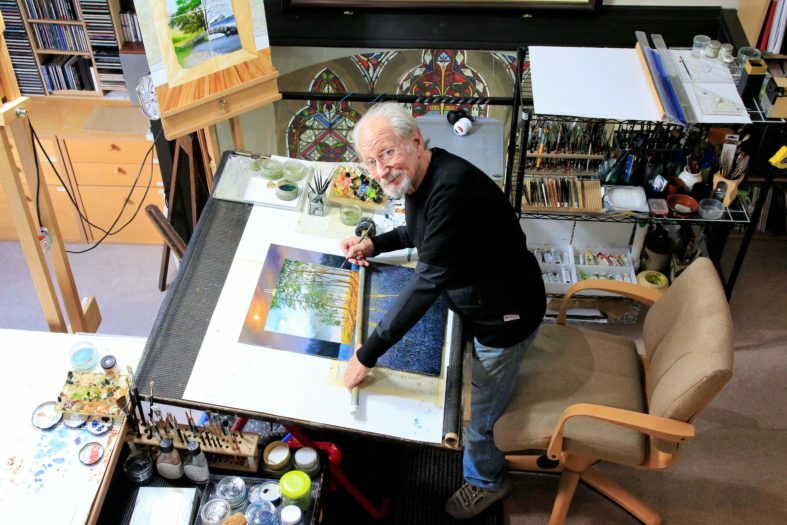 With his artistic vision, technical skills and understanding of art materials now aligned, he was able to unleash ideas that had been forming for years. That realisation has stayed with Neil, helping and guiding him to create his iconic paintings. As his work developed, Neil’s popularity and acclaim grew. His work began appearing in solo exhibitions, more galleries and was featured on television and in newspaper editorials. Neil’s successes have continued, having now sold thousands of prints and originals worldwide, he approaches his 50th year as a professional artist and continues to be hugely successfully with a dedicated following. If you wish to meet Neil or view his paintings, please contact us.